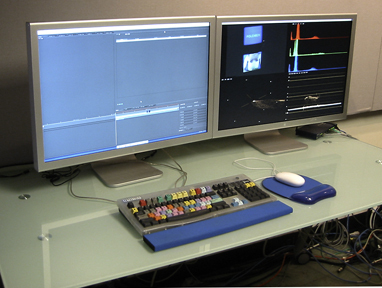 One of BAVC's AJA Kona 3 card capture systems, in an 8-Core Mac Pro Workstation using Final Cut (Pro) Studio v6, the Color application is shown on 2, 30" Cinema Displays. The purpose of this site is to encourage the preservation of historic video using the mature technology of digital capture [video capture cards] to create individual video files, which would be stored on mass storage media such as hard drives (HDD) or data tape (DT). The individual video files created can be copied without loss -- forever. The digital files would be migrated to new storage with no loss due to recapture, error or budget restrictions. Note to users who can't "do preservation now" - For those of you who can afford (a) the digital equipment, (b) software such as Apple Final Cut Pro X, or (c) can't find good used historic VTRs, there is Cold Storage. Cold storage will keep historic video tape viable for decades, if you can find the historic VTRs in the future. Read the essay on Cold Storage. Seal video tapes in thick aluminized bags with a few sheets of museum quality matboard to act as a moisture buffer. Warm-up using an empty Styrofoam cooler for 8-hours; unseal the bag and the magnetic tape is ready to use. Brief History of Imaging Technology - v28, April 2013 - While covering the full range of imaging, from lens-shaped stones (3000 BC) to modern digital cameras, the essay explores significant points in the development of analog electronic and digital technology. Video and digital imaging are related to their predecessors and shown in historical context, including an extensive timeline and discussion. Storage of Videotape - Storage of videotape in a refrigerator at 45°F, sealed in bags with a moisture buffer is recommended. Cold Storage of Cultural Artifacts by Tim Vitale, v17j was updated November 2011. Source of scientific information by Mark McCormick-Goodhart is found in the <Library> and on the proven CMI Packing Methodology also by MMcG is found at the WIR website. Direct advice from MMcG can be solicited from <Contact Us> on his imaging research website Aardenburg Imaging & Archives. Conundrum of Videotape Storage - Storage of videotape at lower temperature and humidity might further prolong the life of videotape, but the equipment needed to playback the artifacts is finite. Converting Analog Videotapes to Digital, by Jim Wheeler, April 2008, for Digital Forward - A very useful essay on the use and advantage of using hard drives (HDD) and data tape (LTO) for the storage of digitized analog video files. <Migrate Digital> is a description of the digital capture process using video capture cards (inside computer box) or external analog-to-digital (ADC) plug-in boxes, using Final Cut Pro, Avid or Adobe Premier software, for the acquisition of files which are output as self-contained individual video files, in uncompressed or compressed file formats, that are stored on HDD or Data Tape (DT), preserved forever. <Migrate Traditional> information that will help users follow the traditional pathways to video preservation: (a) select a service bureau that can do the work; (b) find equipment and methods for the in-house migration of analog videotape to new videotape, analog or digital, as a time-based feed of the video signal as the tape is read. Videotape is now an historic storage format that has been superceded by video files held on mass storage such as HD or DT. Data tape (DT) is a common storage medium (DLT, SDLT, LTO, etc.) used by (a) IT Departments for the back-up of their servers, (b) individuals and small-businesses for the storage of digital data such as text, image or video files (among others) and (c) by SAMMA Systems to store vast numbers of individual videotapes that are robotically captured digitally, in a visually-lossless compression format, JPEG2000, on mass storage that is often LTO data tape or server arrays. The <Video ID> button is used to access the Stauderman & Messier Videotape Identification Tool. Following the TechArchaeology Symposium held at SFMoMA in 2000 (published in JAIC, 2001, Vol. 40, whole issue), committed Art Conservators worked on web-based system that can be used to identify video formats based on their probable creation date and an image of the storage medium, such as (a) reel-to-reel videotape or (b) video cassette. The Video ID tool was developed by Sarah Stauderman and Paul Messier based on Sarah's experience working at VidiPax and as a Works-on-Paper and Electronic Media Conservator at the Smithsonian Institution Archives. The Texas Commission on the Arts, Videotape Identification and Assessment Tool requires that one know the format, but has extensive information on storage cases and markings that can be very valuable in surveys. The <Museum> holds links to all the major video equipment image repositories. Stanford University Libraries (SUL) hold a substantial collection of Ampex equipment and product literature; an Ampex VR 1000 from the collection can be seen on exhibition at the San Francisco Airport. On the West Coast, Richard Diehl has collected hundreds of cubic feet of historic equipment and offers a Museum of Extinct Video Recorders and a Museum of Extinct Video Equipment on his LabGuys World website; seen by appointment. 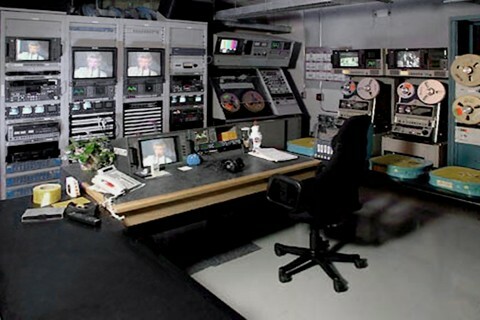 The <Library> contains valuable information on the science, history and technology of video capture and preservation. The Video Guide by Charles Bensinger (1981), is an invaluable user-accessible guide to historic video equipment; presented as online text and images.